Pluto, God of the Underworld, is the ruler of Scorpio. (In Greek mythology, the corresponding god was Hades). In Astrology, the energies of Pluto are transforming. Pluto represents subconscious forces, ruling all that is "below the surface". On the up side, Pluto is associated with renewal and rebirth. It represents endings and new beginnings, as well as spiritual growth and rebirth. 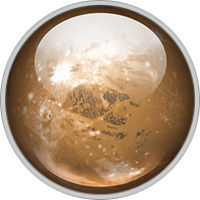 Negative expression of Pluto is an obsessive desire for power and control and general destructiveness. In the chart, the position of Pluto by sign will be shared with other people in the same generation due to the comparatively slow movement of Pluto, the outermost planet, in the heavens. By house, the position of Pluto shows where individuals search for truths and deeper meaning. This area of life may be associated with change, upheaval, power struggles, and issues of control. Pluto in aspect to other planets in the chart colors those energies with obsessive qualities, power struggles, the need to find deeper meanings, and willingness to explore and examine. Where we find Pluto in the chart is where we either seek change and transformation, or have it thrust upon us if we refuse to accept our deepest needs. If we fear Pluto’s energies, or our "dark" side, destructiveness (both directed at ourselves or others) is a byproduct. Pluto’s energy may be subtle, but its results will hit you like a ton of bricks. This planet is about transformation, regeneration and rebirth. Things aren’t pretty with Pluto, but they do get done. Pluto says "out with the old and in with the new", and we’d better be ready for it. If we’re not, this planet will simply have us wallow in our misery. Pluto asks us to transcend that which we know, redeem ourselves in the process, and come out stronger as a result.